VINIFICATION: The grapes dried in wooden crates for several weeks. They are then pressed and the must is fermented in stainless-steel tanks. "Falstaff Magazin" has rated the wine "St. Michael-Eppan San Michele Appiano Sanct Valentin Comtess Passito Sudtirol - Alto Adige, Trentino-Alto Adige, Italy" from the vintage 2013 on 06.07.2016 with 90 of 100 points. "Falstaff Magazin" has rated the wine "St. Michael-Eppan San Michele Appiano Sanct Valentin Comtess Passito Sudtirol - Alto Adige, Trentino-Alto Adige, Italy" from the vintage 2011 on 23.06.2015 with 91 of 100 points. 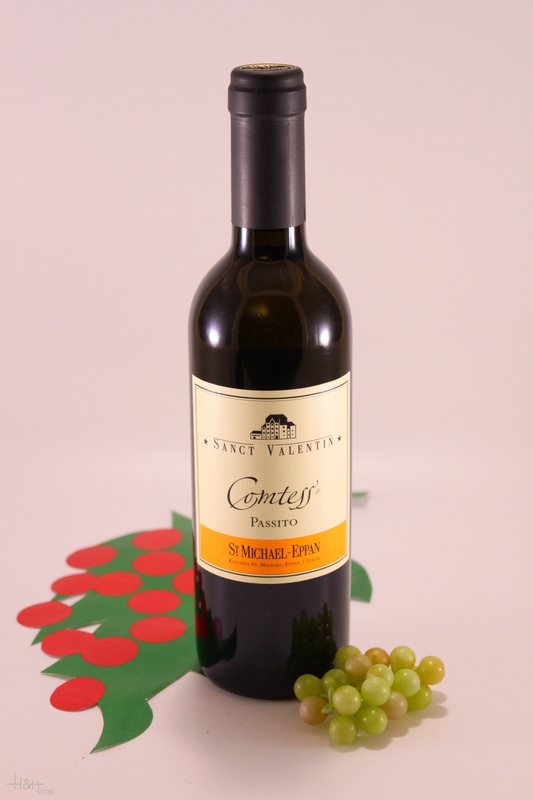 "Falstaff Magazin" has rated the wine "St. Michael-Eppan San Michele Appiano Sanct Valentin Comtess Passito Sudtirol - Alto Adige, Trentino-Alto Adige, Italy" from the vintage 2010 on 05.07.2013 with 92 of 100 points. "Luca Gardini" has rated the wine "St. Michael-Eppan San Michele Appiano Sanct Valentin Comtess Passito Sudtirol - Alto Adige, Trentino-Alto Adige, Italy" from the vintage 2009 on 02.11.2012 with 89 of 100 points. "Falstaff Magazin" has rated the wine "St. Michael-Eppan San Michele Appiano Sanct Valentin Comtess Passito Sudtirol - Alto Adige, Trentino-Alto Adige, Italy" from the vintage 2009 on 11.07.2012 with 91 of 100 points. "Falstaff Magazin" has rated the wine "St. Michael-Eppan San Michele Appiano Sanct Valentin Comtess Passito Sudtirol - Alto Adige, Trentino-Alto Adige, Italy" from the vintage 2008 on 13.07.2011 with 91 of 100 points. "Vinous Antonio Galloni" has rated the wine "St. Michael-Eppan San Michele Appiano Sanct Valentin Comtess Passito Sudtirol - Alto Adige, Trentino-Alto Adige, Italy" from the vintage 2006 on 01.10.2009 with 92 of 100 points. "Falstaff Magazin" has rated the wine "St. Michael-Eppan San Michele Appiano Sanct Valentin Comtess Passito Sudtirol - Alto Adige, Trentino-Alto Adige, Italy" from the vintage 2003 on 10.03.2006 with 91 of 100 points. "Stephen Tanzer" has rated the wine "St. Michael-Eppan San Michele Appiano Sanct Valentin Comtess Passito Sudtirol - Alto Adige, Trentino-Alto Adige, Italy" from the vintage 2002 with 95 of 100 points. Color: deep impenetrable ruby with violet reflections Smell: This Lagrein selection is a multifaceted wine. It reveals aromas reminiscent of morello cherry and bilberry, with notes of licorice, coffee beans, vanilla, clove and black tea, which makes it spicy and fruity at the same time. Taste: The wine is harmonious on the palate with very compact and concentrated, multilayered flavors combining juicy fruit with spicy, peppery elements and a slightly sweet note of dark chocolate rounded off with silky tannins. Pinot Nero Luzia - 2018 - vine cellar St. Pauls 14,65 EUR / 19,53 €/lt. Pinot Blanc South Tyrol - 2017 - Elena Walch 14,10 EUR / 18,80 €/lt. Cabernet - 2016 - vine cellar Nals-Margreid South Tyrol 14,10 EUR / 18,80 €/lt.